Figure 7.5. 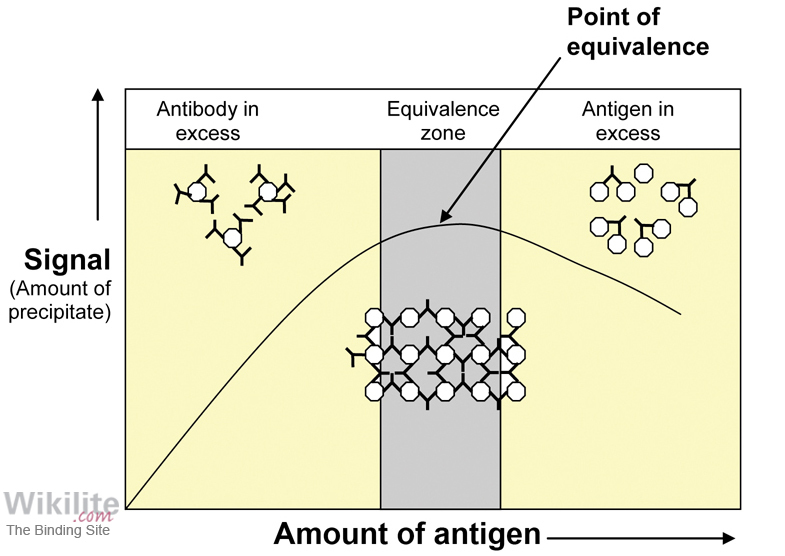 Diagram illustrating the mechanism of antigen excess. The light scattering signal falls in antigen excess because of smaller immune complexes. Antigen excess occurs when an antigen is present in such high levels that it interferes with antigen-antibody crosslinking, resulting in the formation of smaller immune complexes (Figure 7.5). This causes immunoassays to underestimate high concentrations of protein. sFLC concentrations can range from <1 mg/L to >10,000 mg/L. This is a greater range than almost any other serum protein test. Consequently, a small proportion of samples may be underestimated because of antigen excess. Monoclonal sFLCs produced by different patients can exhibit considerably different points of equivalence (the concentrations above which the assay is in antigen excess). It is therefore not possible to predict the concentration at which Freelite antigen excess may occur – it could be 300, 3000 or 30,000 mg/L for different patients. It is important to note that for the majority of patients, their samples will never demonstrate Freelite antigen excess. Assessment of antigen excess forms an important part of immunoassay development and validation (Section 5.6). Figure 7.6. Prozone parameters on the SPAPLUS monitor the change in scatter signal at three different time intervals (labelled A, B, C). R1: reagent 1; S: sample; R2: reagent 2. Freelite sFLC assays available on some instruments include prozone parameters (Section 37.2.3). For example, the Binding Site SPAPLUS instrument monitors the initial reaction kinetics of each sample at three separate time intervals (Figure 7.6.) and compares the results with defined reaction limits established by testing of an extensive library of myeloma and normal samples (Section 37.3.3). Samples detected as being in antigen excess are automatically flagged by the instrument and retested at a higher sample dilution. The Binding Site Optilite has three different methods of antigen excess detection, including; control addition, sample addition and review of the reaction kinetics in a similar method to the SPAPLUS. Whilst the incidence of Freelite antigen excess on the SPAPLUS and Optilite is very low (see Section 7.5.3), some samples may generate such unusual kinetics that the reaction does not prompt a flag, and may result in undetected antigen excess. Such undetected antigen excess is a rare event but cannot be excluded. Therefore, it is recommended that the following statement accompanies all FLC results “Undetected antigen excess is a rare event but cannot be excluded. If these free light chain results do not agree with other clinical or laboratory findings, or if the sample is from a patient that has previously demonstrated antigen excess, the result must be checked by retesting at a higher dilution”. Freelite sFLC assays are also available on some other instruments, such as the Siemens BNII, which do not include automatic antigen excess checks. On these instruments, samples should be tested for antigen excess following advice given in the product insert. This involves retesting the sample at a higher dilution (known as the antigen excess check dilution). These protocols minimise reagent usage and ensure consistency of sample measurement. Whilst these protocols will ensure that the vast majority of samples in antigen excess are detected, Rassner et al. reported a rare sample (~1/10,500 samples) with monoclonal κ sFLCs that was still in antigen excess when tested at a higher dilution. However, a number of other findings were present that were suggestive of MM disease (λ sFLCs were undetectable, the κ/λ sFLC ratio was highly abnormal, κ urinary Bence Jones protein was detected, and renal failure and osteolytic lesions were present). The authors conclude that this case highlights that “clinical decisions should not be based on a single assay…”. 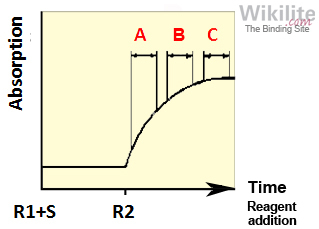 Binding Site recommends that when the result obtained at the antigen excess check dilution is more than 4-fold greater than the result obtained at the initial sample dilution, the sample should be considered to be in antigen excess and the result obtained at the higher dilution should be reported. On the other hand, if the result from the antigen excess check dilution is less than 4-fold greater than that from the initial dilution, the sample should be considered non-linear and the value at the initial dilution should be reported. Examples of the use of this guidance to distinguish between antigen excess and non-linearity are shown in Table 7.7. Table 7.7. Examples of κ FLC non-linearity and antigen excess on a Siemens BNII. *Results from antigen excess check dilution (1/2000) divided by those from the initial dilution (1/100). The results in bold were reported.